Check the map to the right to see where our new office is located. Our first day seeing patients at our new location was Monday, February 11th 2019. We’ve been at the Osborn Drive location for over a decade, and it became a place that we love. From our doctors and staff that spend so much time there to our amazing patients, we’ve collected a lot of powerful memories at that location. That being said, medicine is a field that is always striving for the future. We’re excited to be closer to our peers in the medical field, whether they are dedicated to oncology, cardiovascular care, men’s/women’s health, or general medicine. We hope to continue to discover new opportunities to collaborate with other professionals in their realms of expertise as well as to offer our own experience in blending naturopathic and conventional medicine to create the highest standard of integrative care. Because integrative care often involves the co-management of people’s treatment, one of the obvious benefits of this move is that we are going to be closer to where people are receiving many of their conventional treatments. This has the advantage of limiting trips and helps to ease the burden of trying to consolidate conventional and supportive care. Besides the practical reasons why it’s beneficial to our patients, there are some business-end reasons prompting our move as well. Since leases of medical business property tend to extend for years, part of our decision to move was guided by our estimate of what we see happening in the medical community five to ten years down the road, not just right now. Old Town Scottsdale had been our home for over 13 years, but much of the cutting-edge research and cancer care isn’t located in Old Town, it’s located nearer to the location that we moved to. Additionally, older buildings tend to have their own interesting issues. Some of the issues at our Osborn location had begun to be noticed by our patients and were a consideration in our decision to move as well. From air-conditioning struggles, waterfalls from the ceiling during the monsoons, and an inexplicably shattered desk that we decided was from construction downstairs, there’s been a lot to work through. We hope that our new location will help to minimize administrative difficulties and make our space one that is wholly dedicated to healing. How will this move affect my treatments and my care? The only thing changing in all of this is our location, there won’t be any changes to the services, IVs, or care we provide. 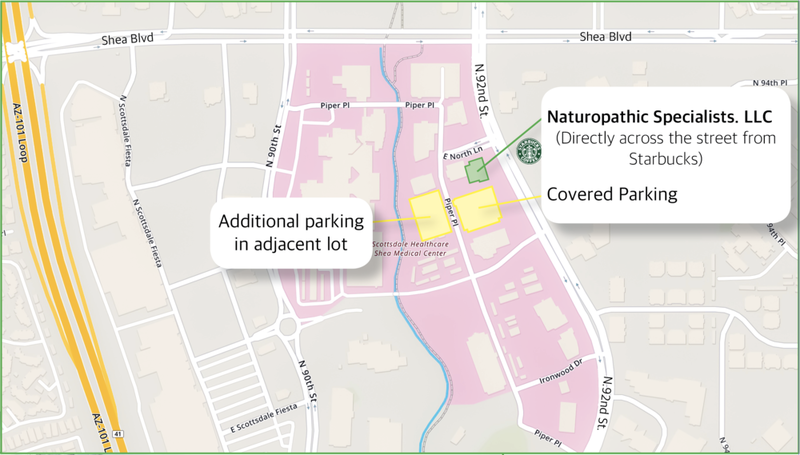 If you’re coming to Naturopathic Specialists presently, you will be able to come to our new location and receive the exact same care. Is the clinic getting bigger? This is a question that the front desk has been asked several times, and it’s understandable. Actually, we’ve simplified and eliminated the need for three rooms that haven’t been used for nearly a year. Our massage therapy space, colon hydrotherapy room, and one of our exam rooms and bathrooms have largely sat untouched with regard to patient care, though that was space that we were going to have to continue paying for if we had renewed our lease. Our new space is designed to provide exactly the services that we plan to offer for years to come without wasted rooms and additional overhead. Ease of access is important, especially in a medical setting. Parking is available immediately adjacent to our building on the north and south side of the building as well as covered parking (handy in the summertime) in the garage just south of our building. Should it be required, additional uncovered parking can be found just steps to the southwest of the main entry. Parking won’t be a problem. Plus, we’re located on the ground floor, so you won’t need to climb any stairs or take the elevator to reach our suite. That means that from parking to walking in our front door should be easier than ever. I have a question that wasn’t asked here. How can I get my questions answered? We understand that change isn’t popular…especially when it involves something that you really rely on. The only thing changing is our address; and that decision was weighed carefully to make sure that overall, we’re going to be better equipped to care for the needs of our patients. If you have a question that wasn’t touched on here, feel free to reach out to us at 480-990-1111. Thank you for being part of our NS family! Street view of our new location, 10250 N 92nd St. Suite 114 Scottsdale AZ 85258. We look forward to seeing patients here beginning February 11th, 2019.